Today’s NaBloPoMo writing prompt asks you to describe your favorite place to read. This is another tricky one – I love to read everywhere. Sure, like a lot of folks, I spend most of my reading time on the couch, in an easy chair or in bed before I go to sleep (or when insomnia wakes me at 3:30 in the morning). My fondest place to read is my porch in New Hampshire. It’s got a variety of comfy seating and plenty of natural and artificial light. There’s a troupe of chipmunks doing acrobatics on the terrace, cicadas in the forest, the gentle breezes of summer. 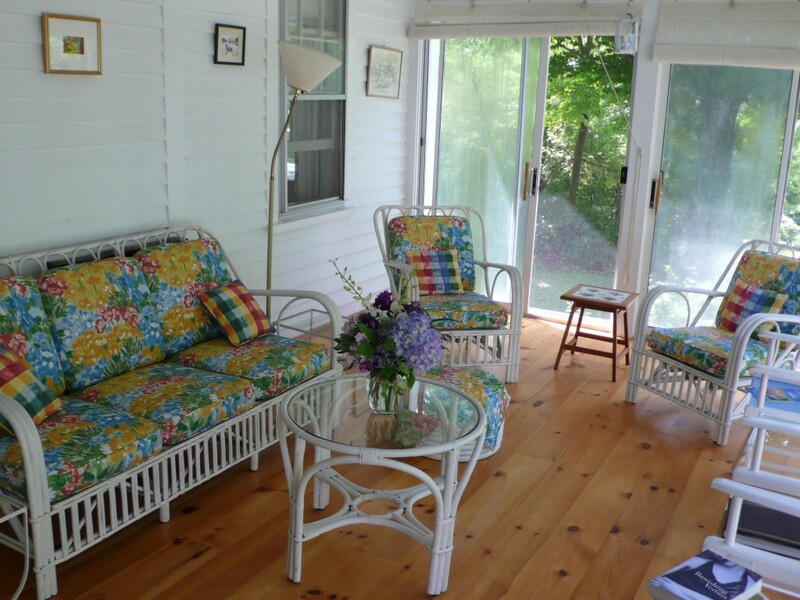 One of my favorite summer reading spots – my New Hampshire porch. Mainly, it conjures memories of my mom and stepdad, both avid readers, and time we spent together on the porch, each of us with a nose in a book. Even though we were occupied with our own adventures or treatises on history or science or politics, we were united by the joy of reading. For 13 years in San Francisco I took public transit because I didn’t have a car. I learned to read on buses, lurching through traffic with poor shocks, and on the smooth tracks of the Muni. I read in drafty subway stations and at drizzly bus stops. I read queuing for everything from prescriptions to concert tickets. I do copious amounts of reading in waiting rooms and doctor’s offices. I’ve mentioned I suffer from chronic pain, which makes me more vulnerable than most to the invasiveness of medical procedures since my nervous system has no more resistance after 12 years of 24/7 pain signaling. If I’ve forgotten to bring something to read, and there are no magazines, I’ll resort to signs on the wall, brochures, exhortations to wash your hands, anything, just to keep my mind off what’s about to be inflicted upon me. Words themselves are a comfort. They’re what my brain pretty much wants to be working on, puzzling over and discovering all of the time. So, I’m happy reading, and I’m happy reading anywhere. How about you? Do you have a favorite chair, beach, library or other secluded spot for reading?